The Border Terrier is a rugged and distinguished breed, widely considered to be one of the oldest dog breeds from Great Britain. It earned its name from its time serving the Border Hunt in Northumberland. This small dog was bred for fox and vermin hunting, meant to flush out game from bushes and shrubs so that hounds in the party could begin their chase. This rough-and-tumble temperament stays with them to the present day where they are at home on the family couch rather than on dew-covered hills. Therefore, they still have a need for thorough and tiring exercise, and they often want to dig in a yard or lawn as if digging for rabbits in their burrows or foxes in their dens. Border Terriers stand eleven to sixteen inches high and weigh from eleven to fifteen pounds. They look every inch of the hardy breed that they are. Border Terriers have a short, wiry coat with different, earthy colors. Their coat must be professionally stripped twice per year, and general brushing each week should suffice for typical dogs. Compared to other wirehaired terriers, their coat is much easier to manage. Due to their deep reserves of energy, they would make a great fit for a family who could exercise them often every day for about an hour and a half. These escape artists also require a securely fenced-in yard and moderate supervision, as they may dig holes in the yard, bark until their owners come home, or think up a complicated scheme to jump the fence. Therefore, they should not be kept outside and instead should be with their family most or all of the day. However, for the right owners, these kind and loving dogs are well worth their unique needs. The Border Terrier is full of both physical and mental energy. This breed will shine with a more complex training program, like agility training or in an earth dog club, where terriers and like breeds can dig to find live animals that are securely housed in cages where they cannot be injured, soothing the dog’s natural hunting instinct. Despite their seemingly endless energy, one quirk of Border Terriers is that they love to watch and will often stop everything, lie down, and watch the scene around them. 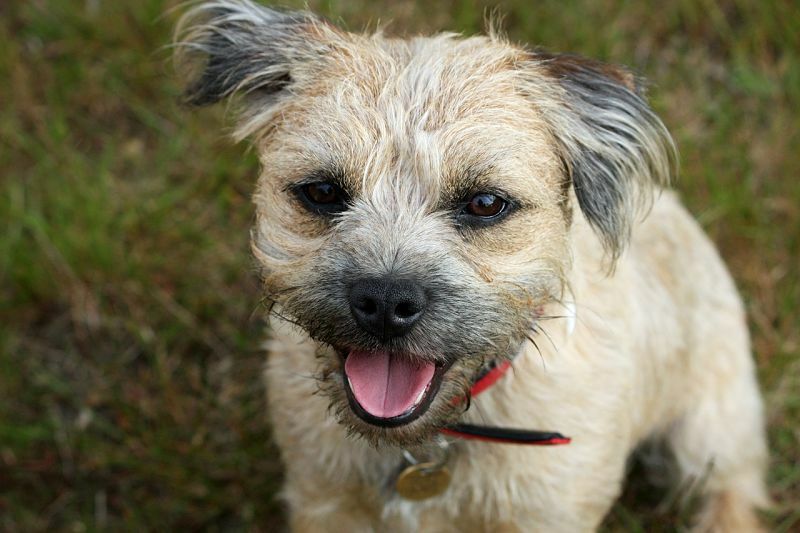 Border Terriers are intelligent and easily trained, two traits that do not often match. They are even-tempered and warmly affectionate towards their owners, eager and happy to please. Like all dogs, they do best with positive training rather than force. They make wonderful therapy dogs for young children and older adults. They do well with cats they have known since puppyhood, but due to their terrier nature they may chase some cats and small animals. However, they are usually well-behaved when meeting other dogs and new people, and will only improve once their owner makes an effort to introduce them to new people and new situations. Like many other purebreds, the Border Terrier is susceptible to health problems, including seizures, juvenile cataracts, various heart defects, hip dysplasia, and other conditions. However, choosing a dog from a reputable breeder or rescuing a dog who is already an adult should minimize any of these complications. The average Border Terrier lifespan is about 12 – 15 years. The Border Terrier is actually a famous breed who remains under the radar. They seem to be Hollywood’s go-to dog breed for a rough or rugged-looking dog. Toots in Lassie, Toto in Return to Oz, and Chomp in 102 Dalmatians are all played by Border Terriers. Even the United States Postal Service’s unofficial mascot is a sweet-looking Border Terrier named Owney, a stray dog adopted by the Albany, New York office in 1888 who ended up visiting every continental state. For owners who understand this steadfastly loyal breed, welcoming a Border Terrier into the family will mean many years of happy companionship.